Fascinating. Lots of new-to-me info here. And here is Beck with condensed milk again. I'm starting to imagine her living in a bunker. I wonder if anyone has researched whether the use of forumla might have any connection to the rise in obesity rates. Pre-1964 and after. I'm sure I could find something. You are right, that would have been a lot of work. I was horrified when I found out that I only got the commercial formula for the first six months of my life and after that I was switched to home made. 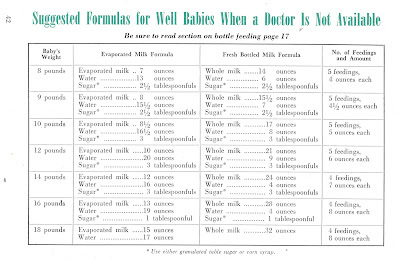 I had no idea that even in my lifetime powered formula was not the main alternative to breastfeeding. I am so glad that we have the powdered because I would have hated to have to do all that mixing and figuring how much of what to add. I actually prefer something made in a controlled environment. I like things to be precise. My mother was a lone advocate of breastfeeding when I was born and persevered for six months. Then the doctor advised her to put me on 2% milk. My mom breastfed me, being the back-to-nature sort that she is. I think I was just transitioned onto whole milk at 6 months or so - I know a lot of local people who still do that, which horrifies me. I was born in 1973 and was formula fed until 3 months old. At which point I started on solids. Ah. Remember the good old days when "fat" was a sign of robust health, not early death? Good times. Like many, I've breast and bottle fed my babies. I don't judge people for doing either or question their motives. There are pluses and drawbacks to both methods. What I don't understand is why people are making formula TODAY, instead of using the pre-made alternatives designed by nutritionists and food chemists and made in hygienic facilities. I've seen recipes that include combinations of Goats Milk, rice milk, cod liver oil, Black Strap Molasses, Liquid Acidophilus, whey powder, yeast flakes, Flax Seed Oil, Liquid Vitamin C, liquid calcium & magnesium, gelatin and/or wheat germ. 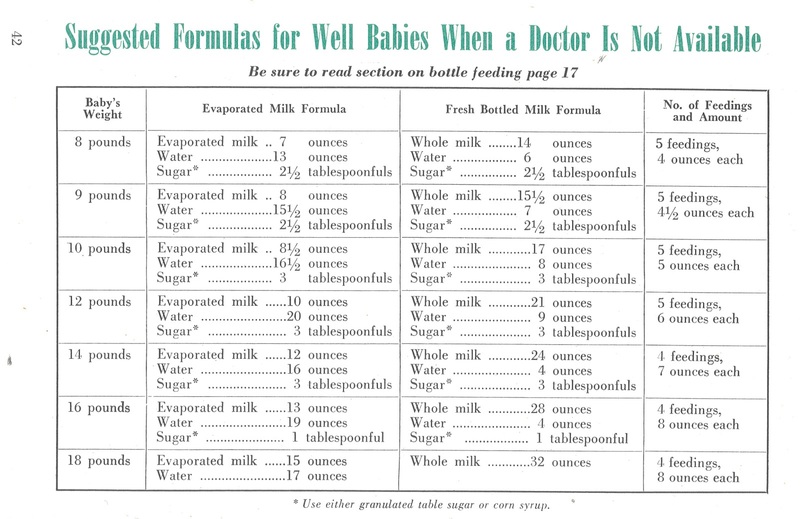 Before I made formula, I'd have my kid mainlining condensed milk. I think they are putting their child's health at risk, because of their anti-Nestle, anti-any-type-of-formula-anywhere-in-the-world dogmatic, political stance. My baby sister was the nouveau generation of canned formula and pampers. Because? I remember fooling with the cloth diapers and yuck. No thanks. What a difference modern manufacturing can make. I was bottle-fed (probably with evaporated milk, given the timeline), but my mother got sick of all the preparation involved and breastfed my not-quite-two-years-younger brother. This fascinates me too. My grandmother adopted my aunt and didn't have access to formula (like you noted, it wasn't available yet), so she lived on homemade formula and corn syrup. My grandmother said it was a Godsend when my aunt was finally able to eat table food. And now, the doctors say wait until the kids are 6 mos before introducing solids. It's amazing how we went from making decisions based on necessity to this "I have to check with the Dr. first" mentality.